Today from 8am to 12 Noon at the Rose Bowl, UCLA Quarterback Brett Hundley and his sister Paris invite you to come down and participate in the Walk To End Epilepsy. The UCLA Spirit Squad will have a presence there, supporting this worthy cause. To motivate you to take part, here are 55 photos of the Bruin Cheerleaders from Friday night. Click on the horizontal ones to ENLARGE them. Also, look for many more photos, coming during the week. 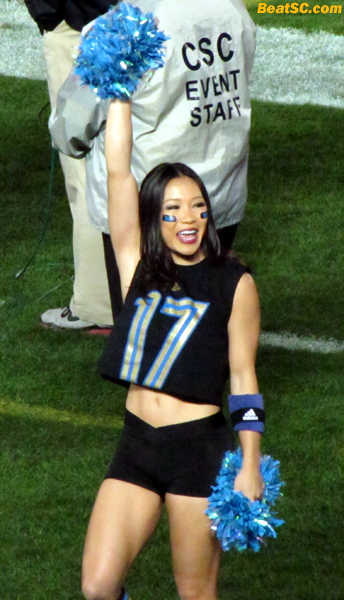 "55 SAVES LIVES" was published on November 17th, 2013 and is listed in UCLA/usc/Cheerleader Photos. Such a great game. I noticed that the quality of the pix are a lot clearer than before, did you get a new camera? the shots look great. not that they didn’t before, just a lot clearer when u click on them. Whatever the theme may be, our Dance Team always put a great spin to their costumes. They look always look great. Awesome win for our Bruins.